I am running the Bengaluru marathon to build a Thalassaemia day care centre in Mumbai! Thalassaemia Major is a serious genetic blood disorder which affects more than 100,000 patients in the country. The disorder is normally detected in the first year of life, and is characterized by the inability to produce appropriate haemoglobin. As a result, adequate oxygen is not delivered to the different parts of the body. Lifelong blood transfusions at regular intervals are required for survival. Repeated blood transfusions result in a build-up of iron in the body of the patient. The heart and the liver are particularly at risk due to the iron overload. Transfusions also carry the risk of blood transmissible infections like HIV, Hepatitis B and Hepatitis C. Due to being multiply transfused, the risks are very much higher for thalassaemia patients. In fact, almost 14% of thalassaemia patients in Mumbai have contracted Hepatitis C. This acts as a double attack on the liver. Unless treated, this can lead to cirrhosis of the liver and carcinoma. How does Think Foundation help Thalassaemia patients? Think Foundation is in touch with patients living with Thalassaemia Major, and endeavours to bring normalcy and happiness in their lives. In pursuance of this objectives, the Foundation organizes daily blood donation camps, assists existing Day Care Transfusion Centres, opens new Day Care Centres, provides iron chelation medicines, monitors health parameters by periodic laboratory investigations, assists patients during medical emergencies, provides support for education, organizes entertainment programmes, conducts camps for building a Stem Cell Registry, raises finances to support curative stem cell transplants. One of the areas of our work is the effort of providing treatment for Hepatitis C for thalassaemia patients. Base line tests need to be carried out to decide the viral load, the need for treatment, and the line of treatment. This has to be followed by counseling and preparation of the patient for the treatment. The actual treatment will involve daily medicines and investigations over a period of 6 – 8 weeks, and a cost per patient of approx. Rs. 2.0 lakhs. The funds raised at the Marathon will be utilized for providing this life-saving treatment, resulting in better quality of life and higher life expectancy for persons living with Thalassaemia Major. 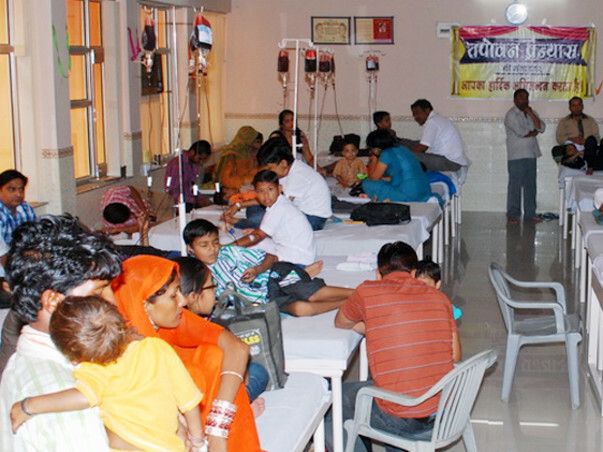 In the first year we aim to provide this treatment to atleast 25 persons. Children are registered with the Day Care Centre and, therefore become the responsibility of the Centre. Visits to the hospital are planned, making it possible to ensure availability of blood units. Quicker treatment means lesser absence from school. Dedicated Centre means safety from exposure to patients with other illnesses/infections. Proper monitoring and treatment for all aspects of the disorder. Possibility of Peer Groups leading to better psychosocial counseling and group activities. Think Foundation wishes to establish a Thalassaemia Day Care Centre at the Mahatma Gandhi Seva Mandir Charitable Hospital at Bandra. The Centre will provide blood transfusions and other aspects of the treatment, to 75 children living with Thalassaemia Major in the western suburbs of Mumbai, and belonging to the lower income groups. The facility will be provided lifelong and free to the children attached to the Centre. The expenses involved in setting up the Centre will be Rs. 20.0 lakhs.